Compost is a vital part of gardening as it ensures healthy soil. The process of turning organic matter into something beneficial, not only adds to the environment but also saves you money. Anything that is organic and not animal based is viable for composting. To start your journey into composting is easy and once you get going, it can prove to be quite addictive! 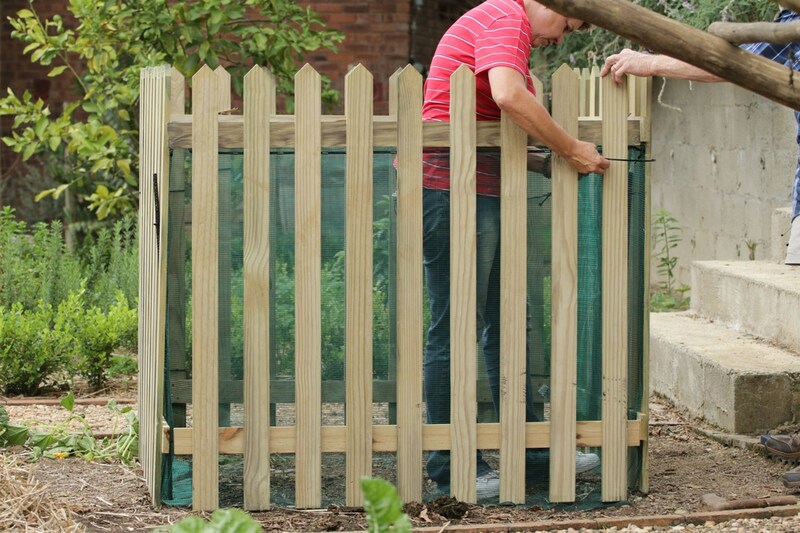 You can buy a plastic composter or build your own. 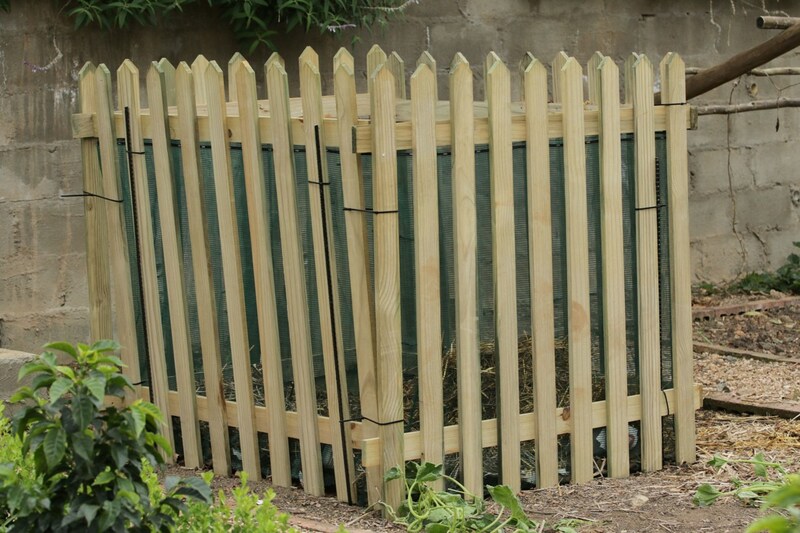 A compost heap can be made within a variety of containers, from a constructed a wooden box to a chicken wire bin. Containers keep the compost neater, but a heap placed directly on the soil is just as good. 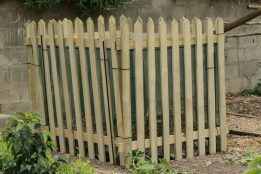 A box constructed of timber should have air holes between the timber slats to ensure aeration and should not be a higher than 1.5 metres. Two boxes are ideal – as one matures the other is filled. Place bricks or clay pipes in the bottom of the box, about 10cm apart and covered with woody plant stems or small twigs, to help with air circulation. Place the boxes on soil and not concrete, as the soil base helps with aeration and drainage. A good guide for assembling materials in the correct proportions is to think of them as ‘greens’ and ‘browns’. ‘Greens’ refers to fresh green matter such as grass clippings, vegetable waste and fresh leaves, which are nitrogen rich, and browns refers to materials such as fallen leaves, straw, sawdust and shredded newspaper, all of which contain high proportions of carbon. The greens would be the ‘wets’ and the browns would be the ‘dries’. Up to 10% of the material can be rough material like small sticks and prunings that will probably not break down completely but will help with aeration and prevent material from packing down and clogging up. Start by mixing the greens together, chopping up anything that is too big to mix easily. To get the correct proportion of carbon and nitrogen spread out two buckets of browns and top with one bucket of greens. This is best done outside a container. Repeat the process and then add some ‘sprinklings’. 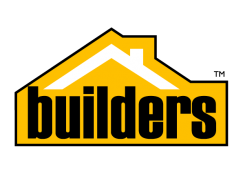 Sprinklings come in many forms, from ground limestone or wood ash to bone meal. Alternatively one can use commercially available organic compost activator and then add a few handfuls of soil. Thereafter add water – one to two litres with a fine mist spray or watering can – taking care not to over water. Repeat this process until all the material is used and then mix the layers together, using a fork, until the material is evenly distributed. Place in the container and turn every four to six weeks. It is a common mistake to use too much water. Remember that ‘greens’ may not look wet but can contain up to 95% water. The overall moisture content of the compost heap should be 60 to 65% – as moist as a wrung-out sponge. Not enough moisture is better than too much, it simply means the compost will take longer to mature. Compost can be made in six to eight weeks, or it can take a year or more. 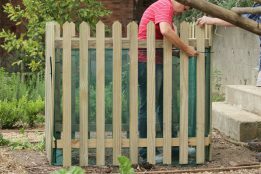 In general, the more effort you put into preparing and assembling the compost heap, the quicker the compost will develop. When the material has turned a dark brown colour and has an earthy smell the composting process is complete. It is then best left for a month or two to mature. Ensure that your compost heap is covered in wet weather. Dry browns (such as fallen leaves) can be kept indefinitely. Collect them in autumn and store in plastic bags. Evergreen trimmings and pine needles do not rot well and should be avoided. Flies and unpleasant smells are a sign of incorrect compost making, often indicating too much moisture in the mixture. Try adding more ‘dries’. Shake as much soil off roots as possible before adding to the compost. Rather send any large quantities of newspaper for recycling to make more paper, but small amounts, shredded, and paper towels can be used in compost. Kitchen scraps consisting of fruit and vegetables, tea bags, coffee grounds and egg shells should be used, but avoid animal products and cooked food. Do not use coal, coke ash, cat litter, dog faeces or glossy magazines. A shredder can be very useful for woody material. A host of small and microscopic creatures create the compost; these are not pests and will not overrun your garden. 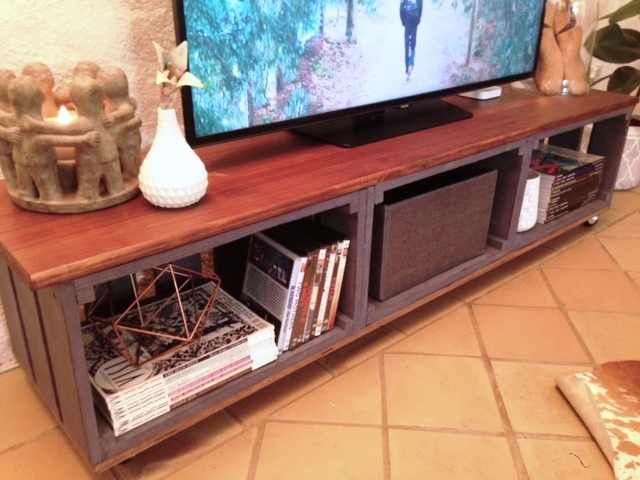 Repurposing is a big part of being a sustainable DIY’er. Using an existing item to create an even better project really gets exciting. Sand all 3x wooden crates using 80g sandpaper, followed by smoother 180g sandpaper. After applying a wood primer and before assembly, paint the individual tomato boxes to the desired colour (Navy Blue chalk paint), using a roller and paint brush. Once the paint has dried, place the 3x wooden crates on a flat surface and secure together using wood glue and 35mm screws. Measure the length of the 3x wooden crates in preparation to cut the counter top. 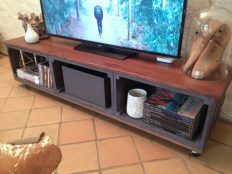 When cutting the wooden counter-top; add 40mm to the length of the 3x wooden crates to create an overhang for the top of the TV stand. Using the same dimensions of the 3x wooden crates, cut the bottom support board. Optional: Router the counter-top to create a smooth edge and create a professional finish. Sand the counter-top and bottom support board using 80g sandpaper, followed by smoother 180g sandpaper. Stain the counter-top and bottom support board with a walnut stain using a roller. Optional: seal with a clear varnish spray. Once dry, attach the tomato boxes to the counter-top using wood glue, and secure with 35mm screws from the inside of each box to hide the screw heads. Whilst upside down, secure the bottom support board in the same way with wood glue and 35mm screws. Secure the 4x trolley wheels to each corner of the support board using 25mm screws. Add decorative storage boxes or shelves to each tomato box and enjoy your TV stand. Ensure that your recycled metal food cans are clear of any labels and given a quick wash to remove any food residue or glue. Spray paint them in a well ventilated room or outdoors. When spray painting, use even strokes and keep the can at the recommended distance 15-30cm) to ensure an even coat. Two coats should give proper coverage. Allow to dry according to product instructions and enjoy your new ceramic look container! 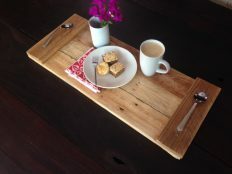 Start by laying out the three pre-cut pieces of wood to form the base of the serving tray. Lay the supporting slats on top of the base and mark out three pilot holes on each side. Using a piece of scrap wood, drill pilot holes in the two support slats using a wood drill bit. Use wood glue and screws to secure the two top slats onto the three base boards. Before adding the handles, give the entire project a sanding, using 80grit sandpaper and then finishing it off with 180grit sandpaper. Treat the project with a sealant to protect the wood and set aside to dry. Drill two holes into the cutlery that will form the handles of the serving tray. 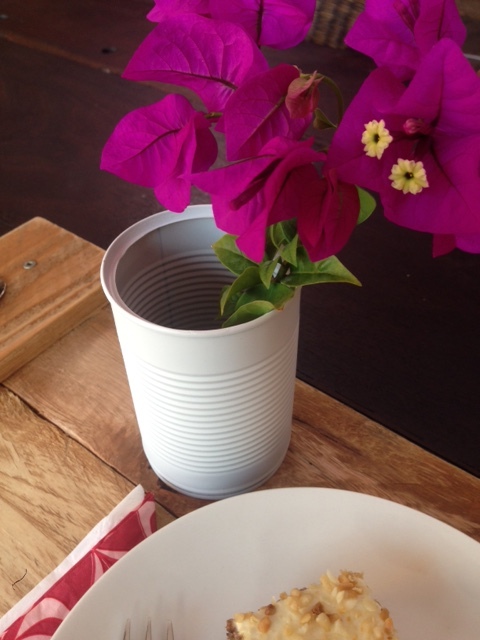 Using a metal drill bit, place the cutlery on a piece of scrap wood and continue to drill a hole through each end. With the sealant dried, attach the cutlery handles to the wooden tray using short wood screws.